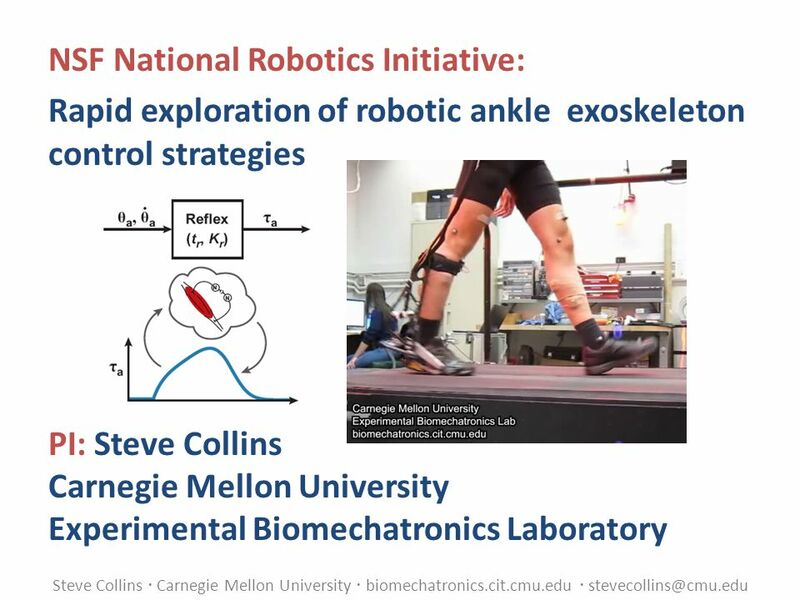 Steve Collins  Carnegie Mellon University  biomechatronics.cit.cmu.edu  NSF National Robotics Initiative: Rapid exploration of. 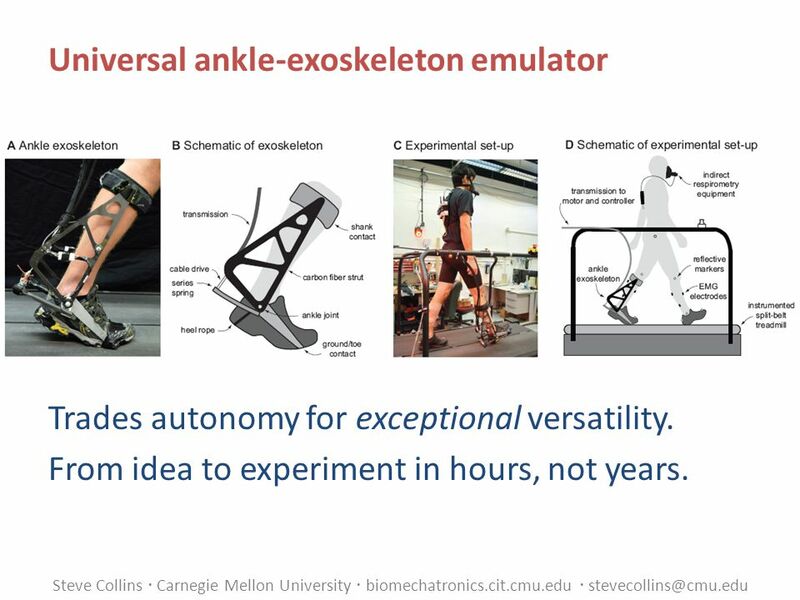 3 Steve Collins  Carnegie Mellon University  biomechatronics.cit.cmu.edu  stevecollins@cmu.edu Universal ankle-exoskeleton emulator Trades autonomy for exceptional versatility. From idea to experiment in hours, not years. 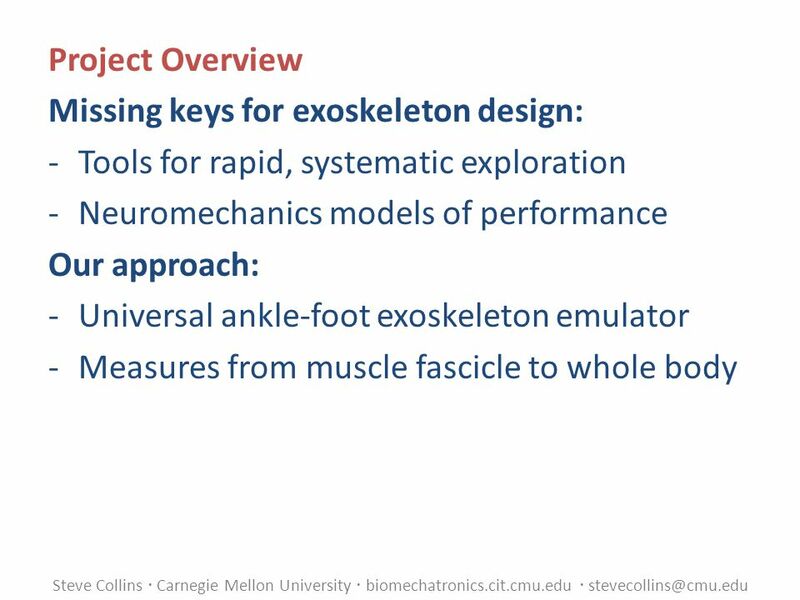 Download ppt "Steve Collins  Carnegie Mellon University  biomechatronics.cit.cmu.edu  NSF National Robotics Initiative: Rapid exploration of." FINAL PROPOSALS Due July 15, 2007 Application Narrative Select a redesign model: how you will embody the Five Principles Modularization: greater flexibility. 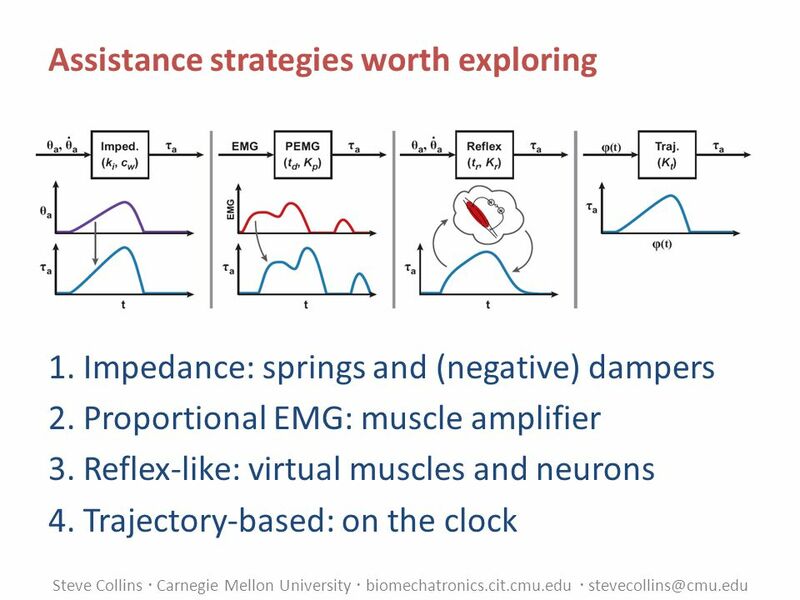 In Vivo Architectural Properties of the Gastrocnemius Muscle in Cerebral Palsy Amir A Mohagheghi, PhD Institute for Biophysical & Clinical Research into. Call FP7-ICT ICT Embodied Intelligence Project Information Project Co-ordinator Prof. Cecilia Laschi Project Manager Dr. Barbara Mazzolai. Strength Increase after Whole Body Vibration Compared with Resistance training. Christophe Delecluse, Sabine Verschueren, Machteld Roelants Faculteit Lichamelijke. Carnegie Mellon ICAPS Sept, 2007 Benchmark Problems for Oversubscribed Scheduling Laura V. Barbulescu and Laurence A. Kramer and Stephen F. Smith. Benjamin Stephens Carnegie Mellon University 9 th IEEE-RAS International Conference on Humanoid Robots December 8, 2009 Modeling and Control of Periodic. DARPA Mobile Autonomous Robot SoftwareMay Adaptive Intelligent Mobile Robotics William D. Smart, Presenter Leslie Pack Kaelbling, PI Artificial. © 2011 W. H. Freeman and Company CHAPTER 20 Introduction to Animal Physiology What Is Life? A Guide To Biology First Edition What Is Life? A Guide To Biology. 10/10/02 Zurich-02 How does the lamprey swim? 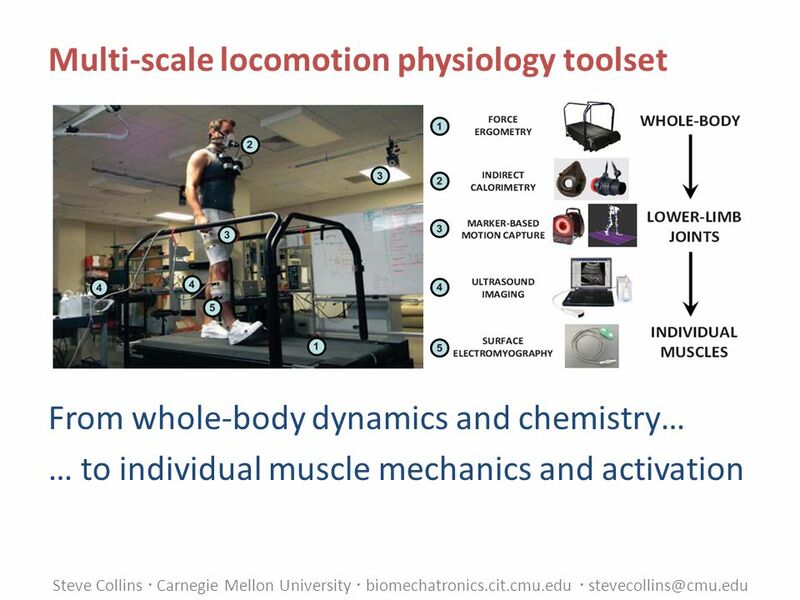 All you ever wanted to know about the CPG for lamprey locomotion The role of coupling, mechanics and sensory. J. P. L a u m o n d L A A S – C N R S A n t h r o p o m o r p h i c M o t i o n Anthropomorphic motion planning J. Pettré, J.P. Laumond, A motion capture. General Overview of System Subject’s step Motion Capture Ground Reaction Forces EMG Sensors Data Acquisition Value A Value B Calculated Values Value X. 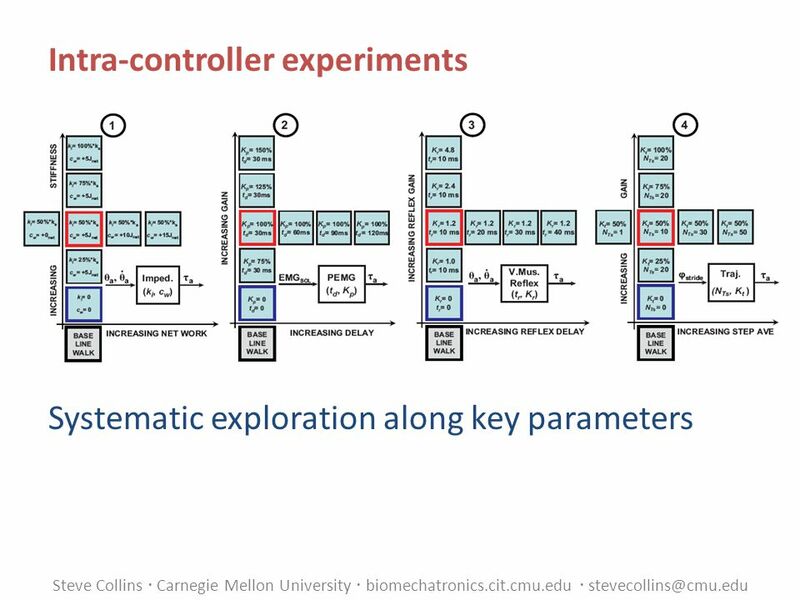 1 Identification of Running Dynamics Perturbation response reveals control architecture. 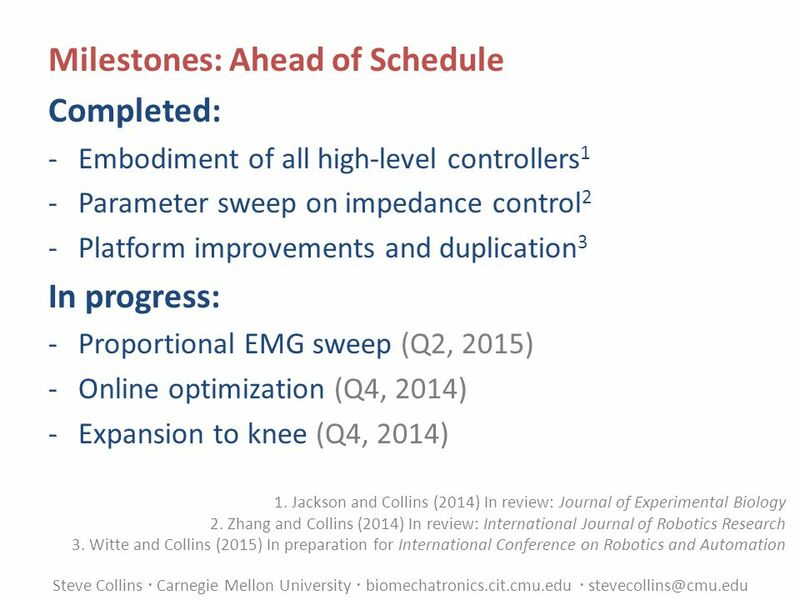 Behaviors for Compliant Robots Benjamin Stephens Christopher Atkeson We are developing models and controllers for human balance, which are evaluated on. 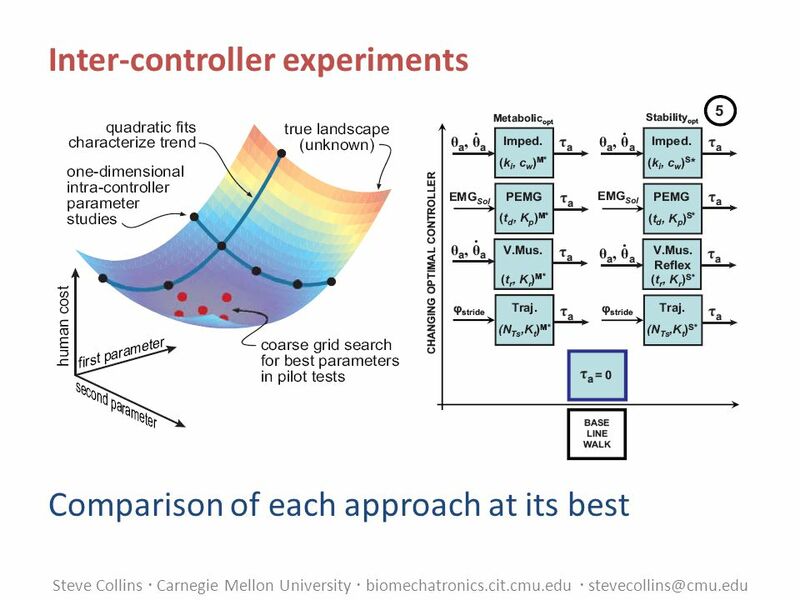 Center for Evolutionary Computation and Automated Design Rich Terrile Symposium on Complex Systems Engineering Rand Corp. January 11, 2007 Rich Terrile. Bad News Bots E2 Project Design Review 5 - 2/28/2008 Ryan Bove Kara Collins * Peter Courtney Kyle O’Reilly Benjamin Rowland. Biopsychology (Psychology 230) Course Content, Organization, & Requirements.